I kinda liked this video. I haven’t been blogging enough lately because of my so-called full time job that leaves me with nothing but hunger and exhaustion by the end of the day, everyday. However, this is a public announcement that could not be missed: Blends has teamed up with RRL by Ralph Lauren to produce a limited number of selvage denim jeans for the historic first release of the RRL X Blends collaboration as part of the Blends Made in USA project. Featuring extremely limited black selvage rigid denim from Okayama, Japan and manufactured in Polo’s US manufacturing facility, the denim pursues the perfect re-creation of the details of vintage denim. Slim in silhouette, rigid black selvage was selected to reflect an enthusiasm for motorcycles and vintage American style. The denim features hidden rivets in the back pockets, mirroring the fine details of vintage denim. The RRL x BLENDS denim release is limited to 50 pairs and each pair is individually numbered. Sanrio welcomes Baby Milo as the newest member of Sanrio characters! NOWHERE CO. & SANRIO has officially created this marriage – announced on WWD Japan yesterday. The launch of SANRIO Baby Milo collection is set for April 2010, available at Sanrio locations. Akiyoshi Kitaoka, a Professor at the Department of Psychology at Ritsumeikan University studies visual perception, visual illusion, optical illusion, and trompe l’oeil. Armed with the knowledge, of how the brain sees things, he creates stunning pieces of eye candy. Damn the first one is the best. I..I…I..I’m so harrdddd. Fitting that I had a military inspired dream last night. More like a nightmare. The contrast between tough military and soft red/pink lips is so GREAT. 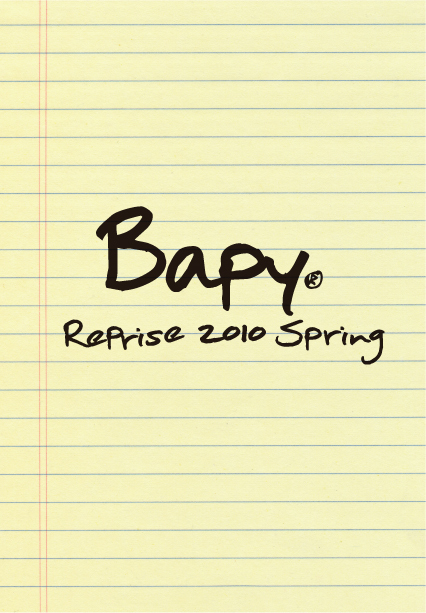 BAPE® is bringing back it’s women’s cu&sew line, BAPY®!!!! Can’t believe this is happening again – considering it wasn’t as popular as expected back when it was sold in Japan.. But the new creative director is Eri Tsukimoto. I’m really excited for the new designs – some will be featured in this month’s MOOK BOOK!! The only spot to be at this New Year’s Eve in NYC! Buy tickets for Hotel on Rivington (and other venues, including H.Wood in Los Angeles) HERE! Prices are already increasing so hurry! Enjoy 20% off sitewide plus FREE Standard Ground Shipping. Offer Valid Monday December 14th & Tuesday December 15th ONLY! USE CODE: ps121415 Valid on all orders $50 and over. Go to promo page HERE!